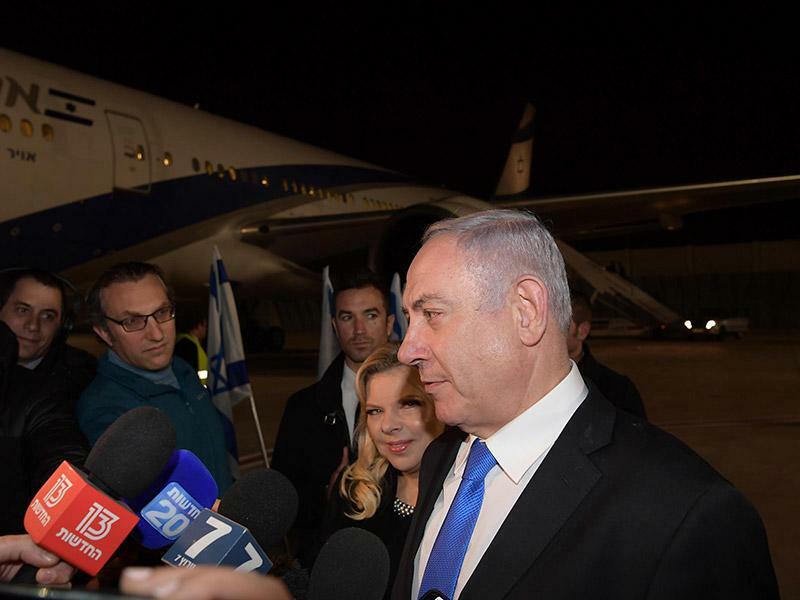 During the middle of the day Wednesday the official verified twitter account for the Prime Minister of Israel stated that PM Benjamin Netanyahu was in Warsaw attending the US-led Middle East summit with an aim to "advance the common interest of war with Iran." It was tweeted in a thread focused on Netanyahu's meetings with Arab delegates at the US initiated conference which was originally touted as focused on the "Iran threat". The AP also confirmed the Netanyahu tweet, which quickly generated multiple headlines focused on what appeared essentially a declaration of war. The full deleted tweet read as follows: "What is important about this meeting. and it is not in secret, because there are many of those - is that this is an open meeting with representatives of leading Arab countries, that are sitting down together with Israel in order to advance the common interest of war with Iran." After being up for about an hour the tweet was hastily deleted, and replaced with the same statement, but instead of "war with Iran" the new tweet was switched to "combating Iran". What is important about this meeting – and it is not in secret, because there are many of those – is that this is an open meeting with representatives of leading Arab countries, that are sitting down together with Israel in order to advance the common interest of combating Iran. Though there wasn't an immediate statement from Netanyahu's office, Tablet Magazine's Yair Rosenberg tried to paint it as an unintentional snafu. The prime minister of Israel, ladies and gents. 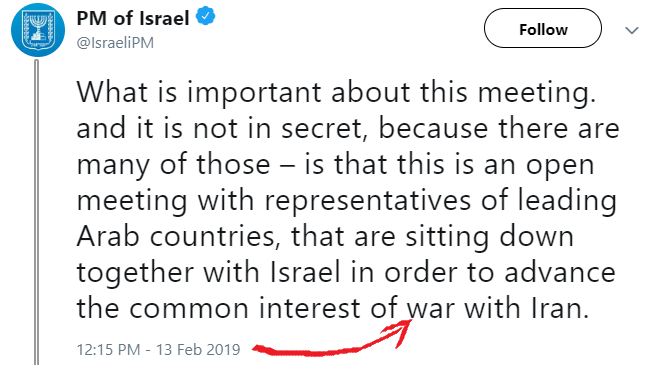 In his own words: Israel is sitting down with some Arab countries (hint hint) to ‘advance the common interest of war with Iran’. "They posted a bad English translation to his Twitter account, and now his spokesman is correcting," claimed Rosenberg. But it appears news editors saw at the very least a crucial and very revealing Freudian slip, and the headlines ran with the original "war with Iran" statement. In perhaps the understatement of the day, the AP's report concluded with the lines, "The U.S. has billed the conference as a gathering about regional peace and security. But Netanyahu and Gulf countries are eager to focus on Iran." Netanyahu's now deleted tweet is a very dangerous sign of things to come, and while we wonder if Tehran's is buying the claim that the thrust of Bibi's message was merely "lost in translation", we doubt it.